ProFoldin desalting columns are designed to remove small molecules like salts, enzyme substrates or ligands from a protein or DNA solution. After desalting, the protein or DNA sample is in a low-salt buffer composed of 10 mM Tris-HCl, pH 7.5. The columns can also be used for buffer exchange of protein or DNA samples to a desired buffer which is used to pre-equilibrate the column. The principle of desalting is size-exclusion chromatography with a molecular cut-off of 5 kDa. The residual salt concentration in the desalted solution is less than 2 % of the original salt concentration. The protein recovery yield is 98 % or higher. The Micro Desalting Spin Columns Set (Catalog number: MDC050) contains 50 pre-packed spin-columns. 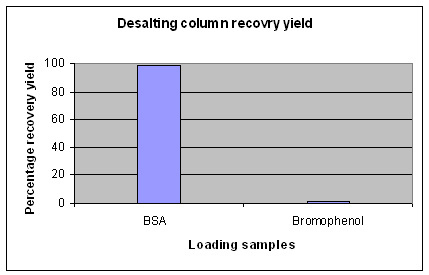 Each column is to desalt 25 µl of sample. The volume of desalted sample is 25 to 30 µl. The Preparative Desalting Column Set (Catalog number: PDC020) contains 20 pre-packed preparative columns. Each column is to desalt 2.5 ml of sample. The volume of desalted sample is 3.5 ml.